At the recently concluded 31st ASEAN Summit Meetings in Manila, the leaders of ASEAN and China formally announced the start of negotiations on the fine print of the Code of Conduct (COC) in the South China Sea. The agreement comes just three months after the foreign ministers from both sides endorsed the framework on the COC earlier in August. Recent progress made on the COC is seen by many as a milestone development, in light of the aggressive brinkmanship in the lead-up to the arbitral tribunal ruling in July 2016. Tension certainly appears to have calmed down significantly since, and discussions for the COC have been actively on-going since the meeting of the 19th ASEAN-China Joint Working Group on Implementation of the Declaration of Conduct in the South China Sea in February. Compared with the history of strenuous negotiations, the relatively fast pace of recent developments does appear encouraging. However, with the 2002 ASEAN-China Declaration on the Conduct of Parties in the South China Sea (DOC) yet to be fully implemented more than a decade after its adoption, one can’t help but wonder how much real progress is achievable with the upcoming negotiations. How different would the COC be from the DOC? Is this another tactic by China to buy time? How united would ASEAN be in negotiating its position vis-à-vis China? The concept for a COC first emerged in the 1990s, but disagreements over whether it should be a legally binding document appeared soon after. In particular, China was strongly against any form of legally binding agreement, which would restrict its activities in the South China Sea. ASEAN and China agreed on the non-binding DOC in 2002 as a compromise and interim agreement with the goal to work “towards the eventual attainment of [the COC].” Little substantial progress has been made since then. So, just how significant is the agreement in Manila? Despite the undeniable diplomatic advancement, the hard truth is that the possibility for any real progress toward an effective and comprehensive agreement remains elusive. ASEAN claimant countries together with the United States hoping for a legally binding final COC are almost certain to face disappointment. China has on various occasions stated its preference for a voluntary, non-binding, or at least non legally binding COC. There also seem to be changing sentiments on this point within some ASEAN countries, notably the Philippines. In an interview in May this year, newly appointed Philippine Foreign Secretary Alan Peter Cayetano expressed wariness toward a legally binding COC, saying that he prefers the COC to first be a non-legally binding “gentleman’s agreement” among claimant countries. He stressed that the COC should be binding, just not legally binding. At this point it appears that COC will likely be heavily based on the provisions already in the current DOC. This means an exclusion of any provisions for enforcement mechanisms in cases of violation. While the exclusion is understandable due to practical considerations including financial concerns, as with the lack of enforcement clauses in most ASEAN agreements, the effectiveness of the final COC would be highly compromised. China’s agreement to restart negotiations for the COC should be viewed with a pinch of salt. The timing of Beijing’s decision to re-engage is in fact very telling. The July 2016 arbitration ruling and Beijing’s refusal to abide by it had eroded China’s image as a good neighbor to its smaller ASEAN counterparts — an image that Beijing worked so hard to instill since the policy of good neighborliness was introduced by then-President Jiang Zemin in the 1990s. It also called into question China’s self-proclaimed commitment to the rules-based international order, and the pronounced benign intentions behind Xi Jinping’s Belt and Road Initiative. Apparent progress on the COC made this year can thus be viewed as Beijing’s attempt to calm discontent and suspicion in the region. Since the arbitration ruling, Beijing has been active in trying to rebuild its image in the region. Not long after the July 2016 ruling, Beijing announced the end of a fishing blockade around the disputed Scarborough Shoal, granting access to Filipino fisherman. By going back to the negotiating table, Beijing is extending an olive branch to its ASEAN neighbors. Beijing’s extension of goodwill, however, is seen by many observers as a delaying tactic. It is of no doubt that China is never going to stop its island-building and militarization activities, despite agreeing to negotiate on the COC. The veil of cooperation and mutual trust created by re-starting COC negotiations will in fact buy China time to complete its ambitions in the South China without constant harsh criticism from ASEAN. Acceding to ASEAN’s long time request for COC negotiations will also help keep at bay any unwanted U.S. interference in the region. 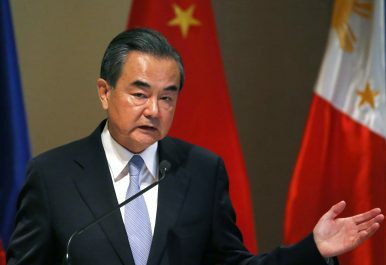 Chinese Foreign Minister Wang Yi made it clear in an interview in August that any substantive negotiations on the COC can only occur in the absence of outside disturbances, clearly alluding to moves by the United States. Despite President Donald Trump’s offer to mediate the conflict in Vietnam, it is unlikely that any ASEAN country would want to undermine the goodwill offered by Beijing by bringing Washington into the COC negotiations. Progress made in the COC must be seen as part of Beijing’s charm offensive since the July 2016 ruling. Beijing’s extension of olive branches toward individual ASEAN countries has been more than successful. Since coming into power, Philippine President Rodrigo Duterte has opted to shelve the arbitration ruling, which almost entirely found in his country’s favor, in exchange for stronger economic cooperation with China. The decision was immediately rewarded with huge tangible benefit in terms of trade deals amounting to $13.5 billion during Duterte’s visit to China in October 2016. Duterte’s visit triggered a domino effect across Southeast Asia. Malaysia has also shown signs of leaning closer to China, as both sides agreed on the flagship East Coast Rail Link (ECRL) project aimed at linking Port Klang to Kuantan Port. In his recent visit to Vietnam, Xi offered his Vietnamese counterpart 12 cooperation pacts across wide ranging areas, in addition to the $1.94 billion worth of deals signed before Xi’s trip. At the same meeting, both countries reached a consensus on peacefully handling their maritime disputes in the South China Sea. China’s economic might is a fact every country in Southeast has to come to terms with. There are huge economic benefits to be reaped from the Belt and Road and ASEAN countries cannot risk being left out. Beijing knows this well and is a master of pitting ASEAN countries against one another. Singapore was the only ASEAN state to openly call for China to respect the tribunal ruling, and this was faced with strong backlash from China. Some analysts have argued that China’s decision to invest in Malaysia’s ECRL project is a strategic consideration, as the railway linking the east to west coast of peninsula Malaysia will slash 30 hours of travel time for cargo shipping through the Port of Singapore. The ECRL, together with Chinese investments in a deep-sea port in Malaysia are cause for concerns for Singapore, a country highly dependent on sea-borne trade for its economic prosperity. Other “stick” measures from China include the detention of Singapore’s Terrex vehicles in Hong Kong and the non-invitation of Singapore’s Prime Minister Lee Hsien Loong to the inaugural Belt and Road Summit. What Can a Limited COC Achieve? Although Singapore continues to maintain its position on respect for international law and freedom of navigation in the South China Sea, it has nonetheless been less vocal on the issue in recent months. With growing economic dependency on China among ASEAN countries, it is not difficult to image a situation similar to the 2012 ASEAN Summit in Phnom Penh, Cambodia repeating itself in upcoming negotiations for the COC. China is in a position to use its economic prowess to pressure for provisions beneficial to Beijing, as well as divide ASEAN on key issues such as whether the COC should be legally binding. Ultimately, it is likely that the final COC would be based off a lowest common denominator, meaning it is unlikely to make any real progress in halting Chinese advancements in the South China Sea. That being said, the COC was never meant to solve the sovereignty disputes in the South China Sea. Although it also seems unlikely that it will help freeze Chinese island building in wake of any settlement, a COC is still useful as a confidence-building mechanism to help improve trust and mutual understanding to help facilitate cooperation. In addition, it might also work as a crisis-management and prevention mechanism in the region. According to Ian Storey, senior fellow at the ISEAS-Yusof Ishak Institute, the COC is likely to include new provisions for the prevention and management of incidents at sea. If true, the COC could join the Code for Unplanned Encounters at Sea (CUES) in making the South China Sea safer for all seafarers. Lee YingHui is Senior Analyst with the Maritime Security Program at the S. Rajaratnam School of International Studies, Nanyang Technological University.